What Type of Fan Do You Need? 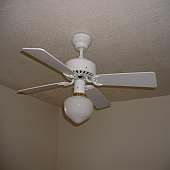 In your home, there are many different types of fans used. Some simply move the air around, some blow through coils to produce and move heat and air conditioning throughout the home, and yet others are used to exhaust air from the home. Here are some of the top articles I've written to deal with air movement, efficient heating and cooling with fans, and exhaust fans for the health of you and your home. Do not underestimate the savings on your utility bill by using ceiling fans in your home. With reversible direction swithes and speed controls, they really are a nice addition. There are a variety of price ranges for ceiling fans ranging from the inexpensive, lesser quality fans to the high quality fans that run the most smoothly and quietly. They run more quietly because they are more balanced, thanks to sealed ball bearings and closer magnetic drive posts in the motorized section of the fan. Ceiling fans come in three mounting styles: flush mount, universal/standard mount, and those for an angled ceiling mount. There are things to consider like fan speeds, blade lengths, whether you need a ceiling hugger fan or one that has a pipe to hang it closer to the floor. Do your homework before you purchase a ceiling fan, they are not all alike! A bathroom vent fan is an important part of every bathroom in the house. You may think that its only purpose is to exhaust smelly air from the room, but in fact, its more effect use is to remove warm, moist air from the interior of the bathroom to the outdoors. You see, warm, moist air not only encourages mold growth, but also can cause damage to a bathroom. If yours doesn’t have a bath fan and it smells musty, it’s likely you need to install a bath fan. In fact, local building codes often require that you install a bath fan that is sized to the specific area of your bathroom. A key to a healthy, comfortable home is ventilation. The use of exhaust fans, ceiling fans, and bath fans can keep a home's indoor air quality from becoming too humid, dry, stale, dusty, or mildew ridden. Although you can control humidity with a dehumidifier and dry air with a humidifier, those alone don't necessarily provide good ventilation. With the use of heat exchangers, for instance, you can pump out the old, stale air and replenish it with new, clean, crisp air. The best part is that this air is run through a filtering system to draw out most of the pollutants. Air exchanges, often referred to as heat-recovery ventilators, draw in fresh outside air and replace the stale inside air within your home. To do this, cool outside air is drawn in through a heat exchanger where it is warmed before being released throughout your home through the ductwork. This saves you money on heating costs. The stale air is already warm, so it does the heating through the heat exchanger before it is released outside the home. What Is A Range Hood? Range hoods are used to exhaust water vapor (steam) and heat away from the cooking area above the range top. These exhaust fans can vent either up into the cabinet duct work, out the back through the wall, or be blown back into the room through the front-facing vent holes in the range hood. Along with air removal from a hot range top, they also collect any grease that is airborn from cooking. They collect the grease in filters and dispel the air through a vent pipe or back into the room, away from the area you are cooking in. Ceiling fans are a great choice for individual rooms in your home. They can be used in winter or summer mode to move and mix the air. Here's how to simply install a ceiling fan in your home. As with other things, size does matter when it comes to bath fans. The size and force at which the air is removed from your bathroom should be considered before buying a bath fan. In this article, I examine the proper steps in determining the properly sized bath fan fr you bathroom. A bathroom vent fan is an important part of every bathroom in the house. You may think that its only purpose is to exhaust smelly air from the room, but in fact, its more effect use is to remove warm, moist air from the interior of the bathroom to the outdoors. What is a Baseboard Heater? Why Do Wall Switches Make Buzzing Sounds? What is a Time Switch Used in Electrical Equipment? When Do You Need a Permit for Your Renovation Project?